With the arrival of the fall season and colder weather, we’re starting to see sweaters, heavier coats and maybe even some scarves. We’re also beginning to experience the sensation of bare feet on cold floors in the mornings. Probably not the most favored way to start off the day and an added excuse to stay in bed for as long as possible. But, what if there was a way to still enjoy beautiful hardwood flooring without the shock of cold feet in the mornings? Radiant heating could be the answer you’re looking for. Radiant heating systems in subfloors are becoming more and more popular in new constructions as well as home renovation; and, thankfully for homeowners, radiant heating systems are now more affordable than ever. Radiant heating systems can be used under flooring, on wall panels and even on ceilings. Radiant floor heating systems are a lot more common in household settings than the wall or ceiling systems and have the potential to be a lot more efficient than traditional heating systems, including baseboard heating (not to mention more beneficial to those suffering from severe allergies). Radiant floor heating is quieter than traditional heating methods, it doesn’t dry out the air in your home and it heats an entire room more evenly. There are three major types of in-floor radiant heating systems: heated air systems, electric heat systems and hydronic heat (hot water) systems. 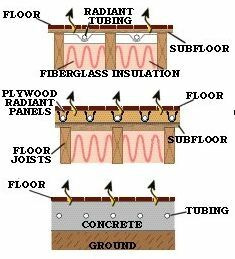 Radiant floor heating systems can either be built within concrete subfloors (usually with new constructions) or can be installed as a separate entity directly below the new flooring to be installed. In some situations, radiant heating systems can be set up from underneath existing floor and subflooring (as long as you have access to the flooring joists from the room below). It’s important to keep in mind that radiant heating systems will add weight to your subfloor, so the appropriate support precautions must be taken to ensure structural integrity. Pretty much universally conceded, the most cost-efficient and most popular floor heating system type is the hydronic heating system. Hydronic heating systems are controlled with a thermostat and use heated water from a boiler in the home. With the increased demand for heated subfloors in residences, manufacturers have constantly been upgrading radiant heating system technologies. The most recent innovations include using solar energy to power heating systems, aluminum reflectors for the most uniform subfloor heating and special plywood panels with pre-existing cut slots for radiant heat system tubing. Although initially the most popular floor covering for installations over radiant heating systems was ceramic tile, options have expanded to include hardwood flooring, laminate flooring, vinyl flooring, cork flooring and even carpeting. How well heat transfers up to a room via the subfloor is highly dependent on the floor covering material used and some allow transfer more easily than others. Always check with the manufacturer of the particular floor covering product you plan to use prior to purchase and/or installation over radiant heating systems to make sure they approve of their product installed over radiant heat. If it is approved, also make sure to follow their specific installation instructions, as straying may void warranties. Choosing to use hardwood flooring over radiant heating systems definitely narrows down your range of products to choose from, but it can be done — and with beautiful results. Engineered flooring makes installation of real hardwood over radiant heat possible. Because of the unique construction of engineered flooring, involving either an HDF core or cross layers of plywood, engineered flooring can be installed over radiant floor heating systems. Although engineered floors can typically be glued down or staple/nailed down, most engineered flooring manufacturers usually require that their engineered flooring approved for installation over radiant heating systems be installed via the floating method. Glue down applications are not really recommended, as the temperature of the subfloor could potentially cause problems with the adhesive used. Staple/nail down applications are typically frowned upon because of potential damage to the tubing in radiant heat systems by staples or nails. It’s always recommended to double check with the manufacturer of the engineered flooring to make sure they approve their specific product for installation over radiant heat. Additionally, make sure you’re familiar with the requirements for installation of their hardwood flooring product over radiant heat. Some wood species work better over radiant floor heating systems than others. At Hosking Hardwood Flooring, we don’t recommend the use of Maple, Pine, Hickory or Brazilian Cherry flooring over radiant heated subfloors, even if the flooring product is an engineered construction. These particular wood species are just a bit less stable than others are are prone to cracking or splitting when exposed to the temperature and drying factors expelled by radiant floor heating. When working with engineered flooring over radiant heated subfloors, it’s recommended to never raise the surface temperature of the subfloor to over 85 degrees Fahrenheit to avoid damaging the new hardwood flooring. Additionally, make sure to acclimate the new engineered hardwood in the room it’s to be installed in for at least a week prior to the installation. It’s best to put the cartons of flooring into the room and then increase the temperature of the radiant heating system a few degrees each day. Never introduce the new hardwood to the room and then turn the radiant heating system up too high too fast. If you won’t stand for anything but solid hardwood in your home, there is an option for you — Quartersawn Solid Hardwood Flooring. 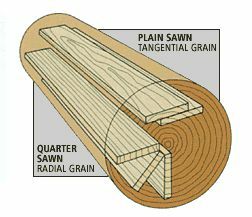 Quartersawn planks are cut at a different angle on the tree trunk than Plainsawn planks (most popular in the hardwood flooring industry). The radial grade patterns of Quartersawn planks allow for freer movement during expansion and contraction that may be exacerbated in the hardwood by radiant heating systems. Typically, Quartersawn hardwood flooring is created from Red Oak or White Oak. If you do choose to go with a solid Quartersawn plank for installation over radiant heat, it’s recommended to go with a narrow board width (3 IN.) rather than a wide one (5 IN.). Additionally, since solid hardwood typically always has to be either stapled down or nailed down during installation, you have to be very careful as to not hit the radiant heating tubes with a staple or nail during the install. As with the engineered hardwood flooring, take special care not to raise the temperature of the subfloor to over 85 degrees Fahrenheit when installing solid Quartersawn over radiant heat. The Quartersawn cut makes the solid plank more stable, but the hardwood can still be damaged from higher temperatures. 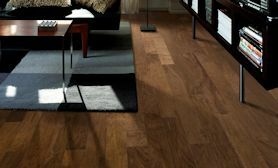 If you want the look of hardwood flooring but are skeptical of installing real hardwood over a radiant heating system, laminate flooring might be the key. The years have only been kind to laminate flooring. When just starting out, laminate flooring looked, felt and sounded completely fake. As technology has improved, so has the realism infused into laminate (visually and texture-wise) as well as the locking mechanisms. Installed side by side, some laminate floors are even nearly impossible to distinguish from real hardwood flooring. Laminate flooring is perfect for floating applications over radiant heating systems as they are not as porous and don’t experience the expansion and contraction that real wood does. Although most laminate flooring products on the market today are approved for installation over radiant heat, it’s never a bad idea to check with the manufacturer of the laminate just to make sure. It is typically recommended when installing vinyl tiles over radiant heating systems to use a glueless floating vinyl sheet or vinyl tile. 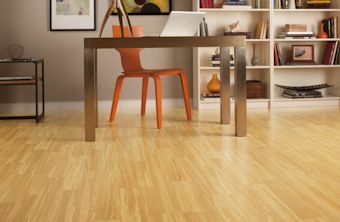 A standard glue down vinyl flooring product may react with peeling and cracking when the vinyl adhesive is exposed with the higher temperatures from the heating system. Always make sure to check with the vinyl manufacturer to make sure their specific product is approved for installation over radiant heating systems. Cork, although a nontraditional floor covering option, is gaining popularity in homes across the country for its multitude of benefits. 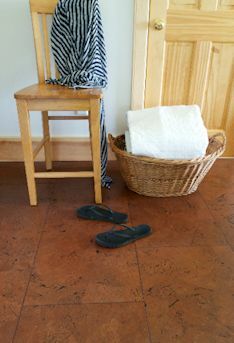 Cork is naturally an excellent insulator, which is a property that can sometimes take away from the quickness of a radiant floor heating system, resulting in a longer wait time for the cork floor to warm up. Even so, there are many homeowners who install cork flooring over radiant heating systems and come away loving the results. Because of its natural insulation properties, cork flooring will retain heat from the system more efficiently than other floor coverings. It’s generally recommended to use floating cork tiles rather than glue down cork tiles because of the effect the heat might have on the adhesives used to glue down. As always, make sure to confer with the specific brand’s installation instructions prior to installation to make sure their particular product is warrantied for installation over radiant heat. Ceramic tile is the most efficient floor covering for use with radiant floor heating systems. Homeowners love using these systems in bathrooms with tile, notorious for sending chills up the spine during colder months of the year. Carpet, as a fabric, doesn’t work exceptionally well over radiant heating because it won’t transfer heat as efficiently or as evenly as a hard surface will. If you do choose to use carpet as a floor covering over your radiant heating system, it’s recommended to choose a short pile carpet and pay special attention to the carpet padding used. Carpet padding is much thicker and more dense than the underlayment padding used for floating engineered hardwood floors and laminate floors and it will drastically reduce the amount of heat transferred up through the carpet from the radiant floor heating system. Ultimately, radiant floor heating systems are a home upgrade that will not only provide comfort when the temps outside drop, but will also provide for a more cost efficient and a healthier way of heating your home. This entry was posted on Monday, October 14th, 2013 at 2:03 pm	and is filed under Acclimation of Wood Flooring, Engineered Wood Flooring, Floating Wood Floors, Solid Hardwood Flooring. You can follow any responses to this entry through the RSS 2.0 feed. You can leave a response, or trackback from your own site. We want to install laminate flooring over radiant heat with a concrete subfloor. Do we have to use padding or anything else between the laminate flooring and the radiant heat? If you’re installing a click lock, floating laminate floor (which most laminates are these days), you will need to roll out an underlayment over the concrete subfloor prior to the installation of the laminate planks. You may find helpful information here on our site: Underlayments for Laminate Floors. Most available underlayments these days perform perfectly over radiant heat. If the laminate you’re installing already has a foam pad attached, you do not need any additional padding. I have hydronic radiant heat in a new construction. It is staple up under the subfloor (7/8″ OSB). I am going to do engineered hardwood floating floor for the bulk of the house but am trying to figure out the bathrooms and utility. I have heard that the vinyl tile or planks (floating) don’t work well for bathrooms due to the moisture, and are iffy with the floor heat (depends on mfg temp rating). Are most modern adhesives and glues on sheet vinyl alright? Or can I use glue down sheet vinyl and just not actually glue it down? Or is vinyl tile/plank really the preferred route if using this material over radiant heat? Many vinyl products can go over radiant heat. It’s important to check, though, with the specific manufacturer prior to purchasing. If you find a product you like, visit the manufacturer’s website and take a look at their installation instructions. We carry Earthwerks LVT, which allows the majority of their products to be installed over radiant heat. You just want to make sure you follow the installation instructions precisely. They offer a lot of different styles ranging from Glue Down to Loose Lay (Floating). All manufacturers are different though. It’s best to check with the specific brand before making any final decisions.